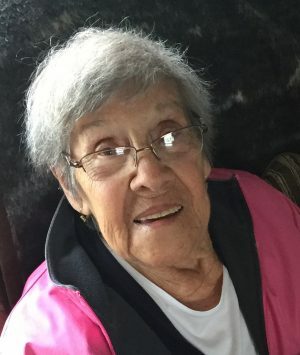 OSWEGO, NY – Josephine Jadus, 92, of Oswego, died Monday April 1, 2019, at her daughter and son-in-law’s winter home in North Carolina. Mrs. Jadus was born in Oswego, the daughter of the late Cassie and Josephine (LoMenzo) Catalano. She was predeceased by her husband, John A. Jadus, in 1996; and her son, John C. Jadus, in 1982. Mrs. Jadus is survived by her daughter and son-in-law, Mary Ann and Randall Murray of Henderson; daughter–in-law, Patricia Jadus Horsington of Florida; her grandchildren, John Patrick, Joel, Elizabeth, Adam, Nathan, Matthew, Brian and Daniel; and 14 great-grandchildren. She was predeceased by her siblings, Joseph, Andrew, Anthony and George Catalano, and Beatrice Denny. Funeral services will be Monday, April 8, at 11 a.m. at the Sugar & Scanlon Funeral Home, Oswego. Calling hours will be prior to the service from 10 to 11 a.m. at the funeral home 147 W. Fourth St., Oswego. Aunt Jo. You were the BEST mother,grandmother, great-grandmother friend and AUNT to everyone. We love you and will miss you and all the great times we had.Love,Donna and Butch.